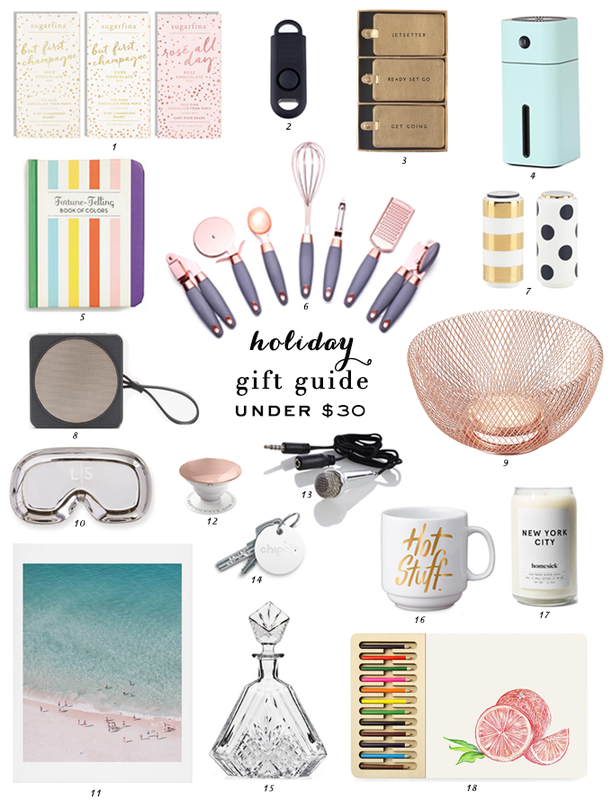 This is always one of my favorite gift guides to put together because I honestly believe that when it comes to gift giving, what matters isn't how much it cost but the thought that goes into it. And I've been told that I have a penchant when it comes to choosing things that look expensive but aren't. These mostly unisex picks which are both fun and practical would make suitable white elephant gifts and they would also work for your friends as well as coworkers. Pairing top shelf Parisian chocolate with Sugarfina's Sweet and Sparkling Bears Champagne Bears made with Dom Pérignon Vintage Champagne, these decadent treats are sure to delight. Give the gift of personal safety in this ultra-compact emergency alarm which is water-resistant, TSA approved and comes with a long lasting battery. These chic, gold, luggage tags are perfect for jetsetters. I have these and they look way more expensive than they are. Compact and lightweight, this cute humidifier comes in seven fun colors with changing LED lights. Conveniently portable and USB powered, it can easily be used anywhere from the car to the office to your home. Humidifiers are a must for me during the to keep my skin from drying out. A fun pocket-sized fortune-telling book that bases its fortunes on the whimsical insights of all things color. Those looking to improve their luck will learn the portents of chromatic combinations, the meaning behind color auras, and the astrology of various hues. Neatly packaged in a box, this set includes a set of essential cooking utensils hat are stylish as they are practical. Whimsically adorned with gold stripes and contrast polka dots, this chic salt and pepper shaker set will work equally well for everyday dining or formal occasions. This portable bluetooth speaker may be small in size but it's big on sound with six hours of playback time. The unique double walled design of this copper mesh bowl makes it an artful decorative piece as well as a functional fruit bowl bowl. This charming eyeglass-silhouette catchall would make a great accent piece that doubles as storage. And free monogramming is included in the $19 price. This wall print brings the beach home with a soothing scene that'll fit in seamlessly with a variety of decor styles and color schemes. Compatible with all smartphones and tablets, this cool accessory secures your grip and acts as a stand for easy texting, calling, photos, watching videos or gaming and when you're done it collapses flat. I don't own one but I have many friends who swear by them. It really does make photo taking a lot easier. This mini microphone transforms your phone into a mini karaoke device and it also doubles as a mike for phone calls and voice recordings. This tiny bluetooth tracker helps you keep track of anything you like with easy-to-use App, available for iPhone and Android phones. Available in six vibrant colors, this upgraded version operates with a replaceable battery. This beautiful cut-crystal decanter elevates any occasion with it's elegant design. This stackable porcelain mug has a fun double meaning which could be talking about it's contents, it's user or both. Following the concept that scent is the strongest tie to memory, Homesick creates 100% soy wax candles with iconic designs and location based scents that evoke emotions and memories that make home a special place in our hearts. Help unleash someone's inner artist with this self contained drawing set. These are great gifts under $30! I have my eye on that kitchen gadget set! That's a great deal for $29.00! Have a wonderful weekend Rowena! These are all beautiful selections. I really love that Kate Spade salt and pepper shaker set and the beautiful fruit bowl; very unique items. Have a wonderful weekend. Oh you really founds some unique gifts under $30 that is impressive. They are fun, attractive and different. Great ideas here, love that sketch pad set and beach print, which reminds me I need to get my shop up on Society 6. The cut crystal decanter is so beautiful. I really like the fruit basket as well, it would look lovely anywhere.The hot stuff mug is adorable as well. These are all lovely gift ideas. That alarm isn't a bad gift idea at all, little things like that can help one feel safer and that's always important. I adore that kitchen set! What stunning colours! These are all such beautiful picks, and some of them look so much more expensive than $30! I especially love the cooking utensil set, they're so chic and would definitely encourage me to cook more! You put togehter an amazing list! Thanks a lot for sharing as the ideas are perfect. The mini karaoke makes me smile and I would love to have such luggage tags. Have a happy week of 1st of Advent!